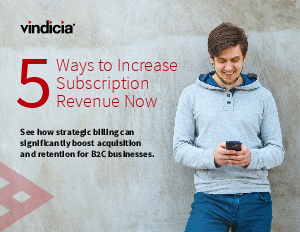 The B2C subscription billing, payments, and retention experts at Vindicia have identified five ways that strategic billing improves a business’s bottom line. First, this ebook explores the basics of subscription billing. Then, we examine five ways that strategic billing measurably improves ongoing revenue streams.Too often, subscription models don’t generate the expected high, ongoing revenue streams.